This is the story about the rebirth of european wilderness, in which the wolf, the wisent, the bear and other rare animals live as freely as centuries ago. Take a look with us into the unrestrained area of the Eastern Carpathians, formerly known as THE WOLF MOUNTAINS. As night falls, an ethereal mist creeps over a forest cover as old as the world itself. The primeval howl of a wolf echoes across the mountains, followed by another and yet another wolf. 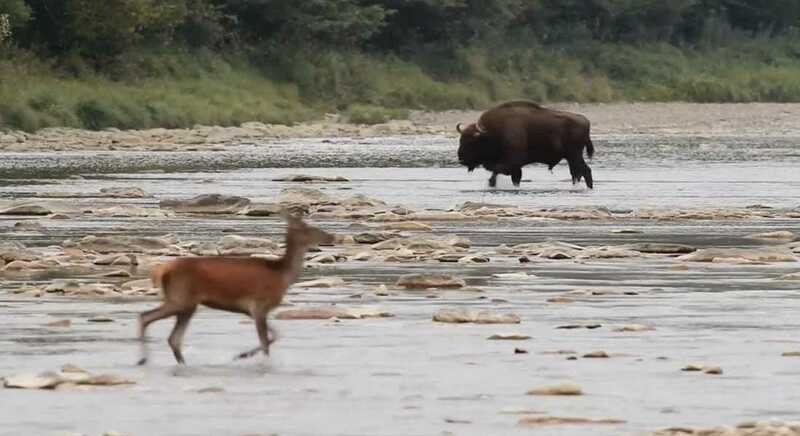 Down in the valley, a wisent turns swiftly, a deer runs off a little and a beaver swims into its hiding place. Only a bear waits in anticipation of sponging off the prey of the wolf. This is the story of one of the last wildernesses in Europe, where each creature plays its role in the eternal cycle of life and death. This land was known in the past as the „Wolf Mountains“. For three years, Slovak filmmaker of wild nature Erik Baláž, together with his friends Karol Kaliský and Jozef Fiala, trekked the length and breadth of the mountains and forests of Eastern Carpathians, a region that straddles Slovakia, Poland and Ukraine. They were searching for elusive wolves and other extraordinary animals, which share this territory. They discovered a world almost untouched by people. Ancient people once revered the wolf and lived side by side. In later centuries, hunters hunted for wolves to their near extinction and farmers occupied more and more land. Only the most resilient plants and animals survived this onslaught. Today Erik’s team records a precious portrait of a wilderness as if reborn from the ashes and uncovers this unique ecosystem. They film wisent, the giant herbivores, which once roamed the vast wilderness, beasts that have once again enlivened this woodland and many more species, such as woodpeckers and salamanders. They film beavers building dams and pools to allow amphibians and insects to live there. They film deer frolicking in the forest during mating season. They film bears down by the spectacular river San in their daily effort to find food. They record the tenacity of animals struggling to survive in a rough freezing winter. And from these mysterious animals, the filmmakers finally succeeded in capturing the glimpses of a wolf – the most elusive animal of all. This film offers a journey back to times, when the European wilderness was truly a wild and living organic entity. It also offers a chance to look into the eyes of the creatures, with which we used to live in our common past. This is the life in the “Wolf Mountains”. just feel emotion by looking at these beautiful animals! I read the story “Butcher’s crossing” which is a terrible example of destruction of bisons in USA! So glad there are people who take care about wildlife here in Europe; I hope as well as in USA or wherever in the world! GORGEOUS! A very inspiring trailer. I can’t wait to see the rest! What great motivation for wilderness work in Europe. I’d still like to talk with you at some point about collaboration.